For many years concrete and wooden piles have been used to keep buildings strong and stable in Michigan. These materials provide durability, but they don’t reach deep into the load-bearing strata. At Matthews Wall Anchor, we offer a more effective, secure foundation repair solution for commercial projects. Matthews Wall Anchor’s experienced structural engineers can repair new or existing structures from large commercial jobs to multi-unit structures by using helical piles, underpinning, and shoring solutions. Contact our team of foundation repair experts and structural contractors for commercial repair solutions so we can accommodate your needs. We’ll find out what type of foundation you have, then inspect your building to locate any damage. We’ll determine how many piers your building will need to make the necessary repairs. We provide free, detailed estimates for the job. If your building has movement or settlement, give Matthews Wall Anchor a call today. Avoiding foundation repairs could result in costly repairs and further damage. 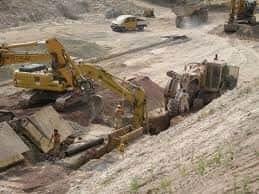 We offer underpinning, piling, and shoring solutions to support and stabilize. To ensure stability, we use the latest products on the market by Earth Contact Products (ECP). ECP is the leading manufacturer of underpinning products, so you’ll be getting the best structural solution for your foundation needs. Also, Matthews Wall Anchor offers commercial services such as snow removal, traffic assistance, road prepping, and gas well industry traffic control to focus on safety and efficiency for every foundation repair project. Contact Matthews Wall Anchor today for a free estimate. We are your structural solution experts for the Michigan area.